Does your new Facebook cover photo look like mush? Facebook recompresses your selected cover photo for the Timeline and there is no way around that. The process tends to make the photo look soft. However, there are steps that you can take to make the photo look as sharp as possible. 1. Correctly size your cover photo and your profile photo. 2. Sharpen your cover photo with Topaz InFocus. 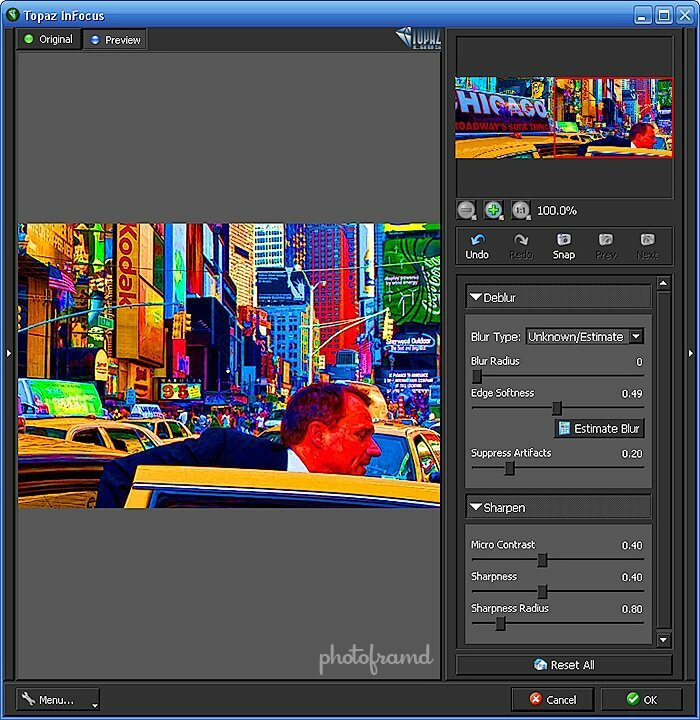 If you have not tried Topaz InFocus, you are missing out on the best sharpening plugin for Photoshop CS5. It sharpens photos without creating halos. Just select Unknown/Estimate from the Blur Type drop down and click Estimate Blur. InFocus will then estimate whether the photos needs sharpening because of lack of focus or motion blur. Next in the Sharpen Menu, set the Micro Contrast to 0.40 and the Sharpness to 0.40 and click OK. InFocus will produce a realistic sharpening, bolstering the contrast without producing halos. It even works great on photos containing text (like screen captures, illustrations and photos of street signs). If this is an original photo (or illustration), be sure to include a watermark attributing the work. If you do not have a logo, just use a nice clear font. Drop the opacity so that it is a subtle reminder without being a distraction. Keep in mind – you can still view any cover photo as a photo (without the profile photo in place). So, don’t assume that the profile photo will be good enough. 4. Save as a JPG with 75% Quality. In Photoshop, use the File > Save for Web & Devices function. Specify a JPG with a minimum quality of 75%. Remember to be creative with your Facebook cover photos. Of course, it can be a photo; but, it can also be a photo illustration all about YOU. Think of it as a huge banner introducing you to the Facebook community. Make sure that it represents “who” you are on Facebook.